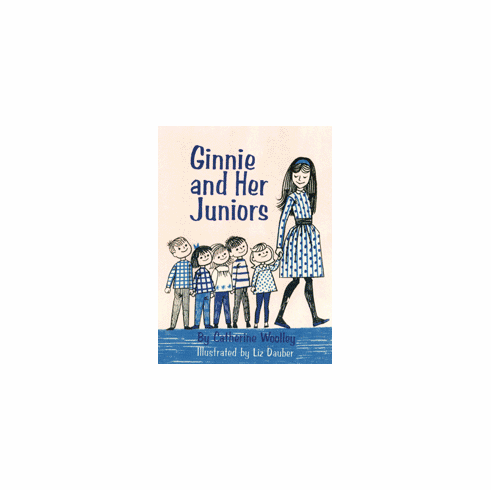 Ginnie and Her Juniors. When Ginnie and Geneva want to earn extra money for Christmas, they think first of baby sitting. Initially, most of the mothers feel they are too young. But suddenly, a few mothers begin to show confidence in Ginnie. From wheeling a baby around the block in his carriage, she graduates to entertaining the toddlers, Susan and Tommy, for an afternoon. Her success with these two difficult three-year-olds lead her at last to the grandiose scheme of starting a day nursery, an endeavor in which Geneva turns out to be a disruptive element! But Ginnie is undaunted and once again tests her abilities and comes up with unexpected rewards. Ginnie and the Cooking Contest. When Ginnie spots the newspaper headline announcing a juvenile cooking contest, she is immediately fired with enthusiasm and determination to win first prize, a trip to Washington, D. C. For weeks she pored over a multitude of cookbooks trying to find the ideal menu to submit and a superlative recipe to prepare the day of the contest. Although an experienced cook for her age, Ginnie begins to lose confidence as she samples her friends' mouth-watering dishes and cannot decide on her own entry. Even with her plans settled, Ginnie finds she has not allowed enough time to prepare her material. How she manages to enter the contest on time, and what happens then, makes a suspenseful climax to a warm, appealing story. Ginnie and the Wedding Bells. Ginnie is delighted when she is asked to be a junior bridesmaid. But her joy is short-lived. Her first shock comes minutes after reading the invitation. A hard-packed snowball, tossed in fun by her friend Geneva, strikes her on the cheekbone, grazing her eye - which begins to turn black. A bridesmaid with a black eye! Impossible! There is nothing to do but to cancel plans for joining the wedding party. That calamity, however, is only the beginning. One crisis follows on the heels of another as Ginnie and her parents arrange to attend the ceremony as guests of the groom. The Christmas wedding is to be held in Nantucket. They plan to go by plane, but the weather is uncertain. Then Ginnie seems to be coming down with a virus - and at the last minute, the cat has kittens, which cannot be found! Will Ginnie and her family be able to get to the wedding after all?